Showing results for tags 'Neptune'. I've looked this up on several sites, they don't give a tech sheet number, they give the service manual number 16010061. I've got that. Unless I've looked over it, I can't find how to get this particular model into test mode. The tech sheet is missing from the washer. Thanks. My Neptune will start filling when Start button is pushed. "ON" light comes on and it starts filling, then the machine shuts off after about 5 seconds. I found if the timer is turned to a SPIN setting and button is held, the pump will run and drain the tub, but that is all. I followed the diagnostic steps in the repair manual. I opened the front (took off the front panel) and examined the motor control board, and yes the 10A glass fuse is blown. Checked continuity and verified it is blown. The repair manual says if the fuse is blown to replace the motor control board and wiring harness. This is different from what I read somewhere, namely to replace the motor control board AND the motor. Can anyone clarify whether the motor will also need to be replaced? The machine is about 19 years old, so not in warranty. Also, my biggest concern is what is the root cause and if I buy these expensive parts and put them in will it just blow again? What are likely reasons for this issue? The problem occurred after I moved the washer to replace the flooring and when I put it back it now has this issue. I therefore feel the moving might have caused something to come loose, but I don't see anything obvious. Any suggestions on what/where to look? Finally any suggestion where to get the parts at a reasonable price? RepairClinic seems to indicate a price about $450 just for the motor control board, at that price better to buy a new washer. Thanks in advance. Here we go again, trying to keep this 1998 Neptune washer a washin. However in order to do so, please assist in the following diagnosis: Several weeks ago, machine stopped during the rinse cycle. No big deal, pushed the start button and it would finish the cycle. That was fine until pressed the start button, it smoked and tripped the breaker. I purchased a new start button and thought all would be good but button smoked again. I have completed the following: Motor test, replaced the control board and wax motor on the door lock (just because I had these on hand). Did Ohm checks via the timer plug and found the pump motor to be excessive high: 72.6K rather then the specified 18. Checked the pump motor directly (with wires disconnected and it was within spec. Problem seems to be in the harness? Or elsewhere? Any recommendations on where to fix what? I recently got a Maytag Neptune washer secondhand, around a year old. Hooked it up at my house and ran a test cycle, and partway through it started squealing very high and loud. After a moment of this, it started to smell of burnt rubber, so I turned it off. Drained it, checked if there was anything stuck in it from the previous owner or anything like that, and tried again. Same thing happened, only this time the belt had apparently had enough, and it broke. Snapped in one spot, and left rubber fuzz all over the inside of the machine when I opened it up. So I ordered a new belt (after reading up in here about finding the right one), waited impatiently for it to get here, and tonight put that new one on the machine. We tried rotating by hand first to check, and found that it spun fine in the counter clockwise direction, but seizes up completely in the clockwise direction. Not really knowing much about this (just inexperienced DIY hacks), we did a good bit of forum reading, and there was one note about one way bearings only spinning in one direction, so thought hey, maybe it's supposed to be like that, and cautiously turned it on. It went through a diagnostic test cycle just fine, but I suspect that's because it only spins in the one direction for that. When we tried it on "normal" the same thing happened, high pitched squeal and smell of rubber, so we turned it off quickly. A spin-only cycle to drain the water was uneventful, but again, that only spins the one direction. Any ideas on what the issue is, or how to better pinpoint it, and/or what to do about it? 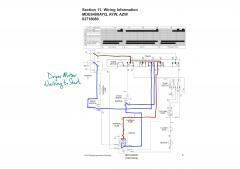 Samsung made Maytag Neptune Washer Tech Sheet MAH8700AW* PUB 16025939 DC68-02028C-02 14 Pages Scanned by hand, annotated on 12 Words cut off, page 12 annotations, referring to small image at the bottom right which shows RY9, CN9 and CN5 state: Incorrect. 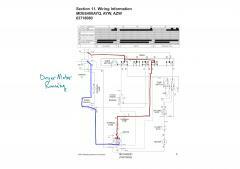 As per wiring diagram CN5-1 is white. And this image is upside down compared to the large image above it.